Newborn twins Caleb and Weston comfort each other just moments after being born. "One of our greatest hopes, when we found out we were having twins, was that, as they grew, they would be good friends and support one another. Seeing them comfort each other just moments after birth was almost like the first step in that special relationship." 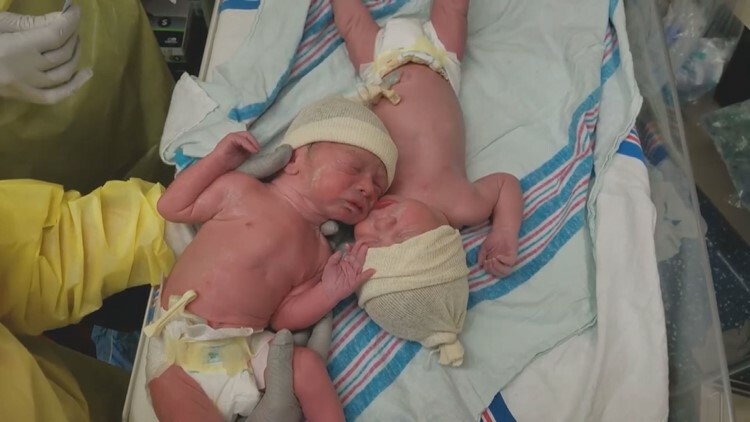 ORLANDO, Fla. (NEWS CENTER Maine) — A dad in Florida captured the sweet moment his newborn sons were reunited after being separated for only moments after birth. The twin babies, Weston and Caleb Lyman, were screaming after being separated but as soon as nurses touch their cheeks together, the newborns fell still and silent. Dane says although the boys were born four weeks premature they were healthy and his wife had a smooth delivery. Dane is a medical school student attending the University of Central Florida. Lisa is a nurse who is currently staying at home to take care for her growing family. Lyman says the brothers continue to comfort each other at home and the family hopes the special bond continues throughout their lives.